Synod 2013 delegates — photo courtesy of Rev. D. Boersema. We’re finally starting to see some newsworthy items coming out of Carman. The Synod has been spending a lot of time in committee sessions. In these advisory committee sessions proposals are drafted. The proposals then get presented on the floor of Synod for discussion. Usually the advisory committee ends up taking the proposal back to work on it further. The process takes time and this is why most of the major items on the agenda of this Synod still have not been dealt with. I’m told that the Synod will run into next week, so we may have to wait until then to hear about some of these big issues. I do have a couple of items that I want to comment on. As reported in the Acts just posted today, Synod did make a decision about the Needy Student Fund. As forecasted, the committee overseeing the Fund has been directed to change their guidelines. The Fund is not a student loan program and students will not normally have to repay any funds. Some of the churches suggested going back to the old system of having classis Funds, but the Synod decided that such a move would be premature. For the next three years, we will continue to have the NSF overseen by a central committee operating out of Grassie. There was an item that surprised me from the other day. It’s found in this set of Acts, article 80. Hamilton-Cornerstone proposed to Synod that we take up official contact with the Presbyterian Church in America (PCA), and make an investigation of this church (with a view to eventual ecclesiastical fellowship, of course). I can’t imagine that this would ever find traction in the Canadian Reformed Churches. The PCA is a mixed-bag. There are solid Reformed people in the PCA and I’ve had the pleasure of getting to know some of them. There are good, confessionally Reformed men who take the Westminster Standards seriously. But…the PCA is also home to many who are only Reformed in a rather elastic sense of the term. The PCA talks a good talk about theistic evolution, Federal Vision, inerrancy, and on down the line on many important issues of the day. However, when men and women step outside those boundaries, little to nothing is done (or can be done) to discipline them. The collective will is not there. Many of our churches have reservations about the RPCNA because of their practice of women deacons. Serious concerns are being expressed about our sister churches in the Netherlands. And now a proposal for official contact with the PCA, where many of the same issues are present? But my befuddlement doesn’t matter. 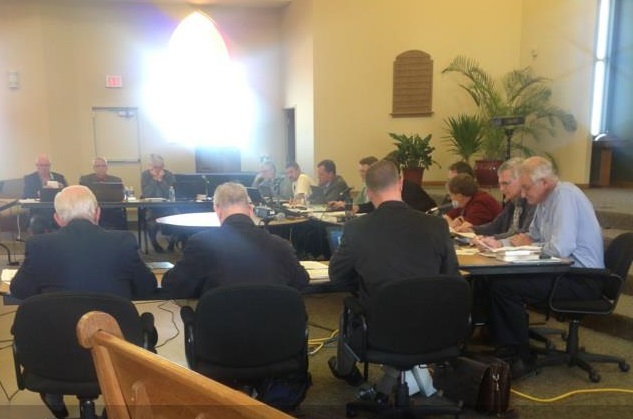 Our Synod wisely sent Cornerstone back to the drawing board to do their own thorough investigation and then present a proposal via the assemblies (i.e. Cornerstone –> classis –> regional synod –> synod). If delegates of the assemblies have any awareness of the array of serious issues in the PCA, I’m quite confident that this will go nowhere. What I would like to see, however, is the PCA become a more confessional and more consistent Presbyterian church — the kind of Church where we automatically recognize that we belong together in close fellowship. We can pray for that today, but I think it’s a ways off. Last of all, I can mention here that the newly appointed Professor of Ecclesiology accepted his appointment yesterday. The day before he had successfully defended his dissertation at Calvin Theological Seminary, so he’s now the Rev. Dr. Ted Van Raalte. I congratulate my colleague with this achievement! The Synod dealt with several appeals by individuals. They were all declared inadmissible for varying reasons. The Synod also dealt with an overture from an individual that had been forwarded by a church. This overture (from E. Van Woudenberg of Chilliwack) was with regard to the casting of lots in the choosing of office bearers. The Synod declared this overture inadmissible since it came on the table from an individual, not from a church. Basically, this means that churches cannot simply forward overtures from individuals. An overture was received from Regional Synod West concerning the manner in which decisions are formatted in the acts of our synods. The overture proposed a shift to a “material, decision, grounds” format. Synod decided not to adopt this overture. The brothers were not persuaded that the existing format (observations, considerations, recommendations) is broken. Finally, the Synod also dealt with our relationship with the Reformed Church of Quebec (ERQ). Not surprisingly, our relationship will continue under the adopted rules, though Synod did encourage our committee (CCCNA) to pay special attention to supervision of the pulpit, admission to the Lord’s Supper, and the ordination of women deacons. This was in response to concerns expressed by some churches. CanRC Synod Carman 2013 got underway yesterday. The first batch of Acts are now available at the federation website. Yesterday involved mostly organizational work. The executive was appointed and the synod divided up the workload amongst advisory committees. However, two important decisions were already made yesterday. The first was a decision to move ahead with a fifth professor for our seminary. This professor will be full-time in the ecclesiology department. The second important decision was the actual appointment of this fifth professor. Synod decided to appoint Rev. Ted Van Raalte, presently minister of the Maranatha Canadian Reformed Church in Surrey, BC. Rev. Van Raalte will be doing his doctoral defense next week Tuesday at Calvin Theological Seminary in Grand Rapids. So, God willing, he will soon be Dr. Van Raalte. I congratulate my friend and colleague and I’m looking forward to seeing him here in Hamilton in the near future!